Heavenly trumpets sound- Georden West’s vision of the Divine Queer is set to manifest at the end of March. In the upcoming show, West, in collaboration with menswear designer Jamall Osterholm, conjures a mythic landscape of religious figures clad in shimmering black. Seraphs, saints, and spirits, dressed in Osterholm’s designs, exude West’s prime influences: Queer bodies, heavenly figures, and historical context. It’s a fashion show, a lesson in the classics, and an immersive performance in one. West, in turn, plays the role of curator, director, professor, and artist. She was the recipient of the Annie Terrill Bushnell and the Nicole Kohn Film Awards and is an alumnus of Emerson College. 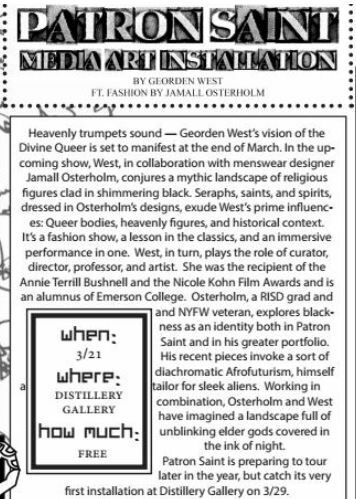 Osterholm, a RISD grad and and NYFW veteran, explores blackness as an identity both in Patron Saint and in his greater portfolio. His recent pieces invoke a sort of diachromatic Afrofuturism, he himself a tailor for sleek aliens. Working in combination, Osterholm and West have imagined a landscape full of unblinking elder gods covered in the ink of night. Patron Saint is preparing to tour later in the year, but catch its very first installation at Distillery Gallery on 3/29.